Starting on July 9th and running until July 31st, Bovada.lv is running their 3rd Summer Millions Poker Open (SMPO3). With $2.3 Million Dollars in guaranteed poker tournaments spread out over 70 events in 23 days……There is bound to be an event or two that not only fit’s into your schedule, but is well within your poker budget. The Events include: NLHE, FLO, FLO 8 and PLO tournaments. Formats Include: Turbos, Super Stacks, Mega Stacks, Knock-outs, 6 max, Hundredaire Makers, Thousandaire Makers, and Re-buys. 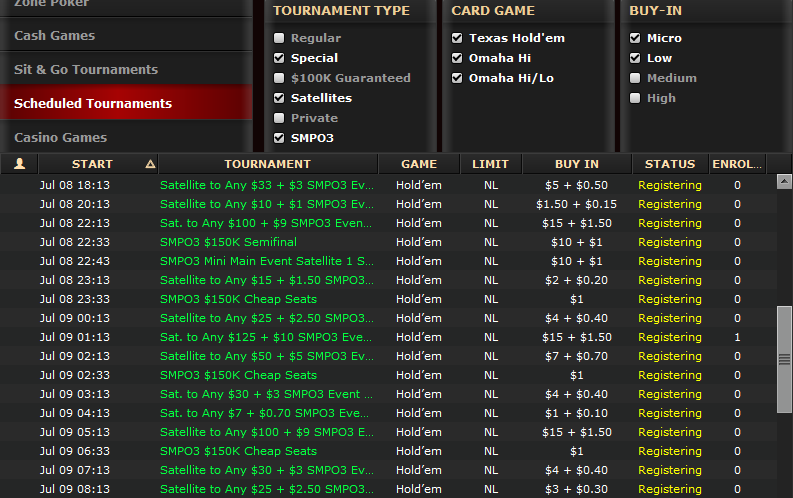 Buy-in’s start as low as $5.50 and there are plenty of qualifiers to all the major events. Complete Event Schedule can be accessed on the SMPO3 tab in the “Scheduled Tournaments” lobby. 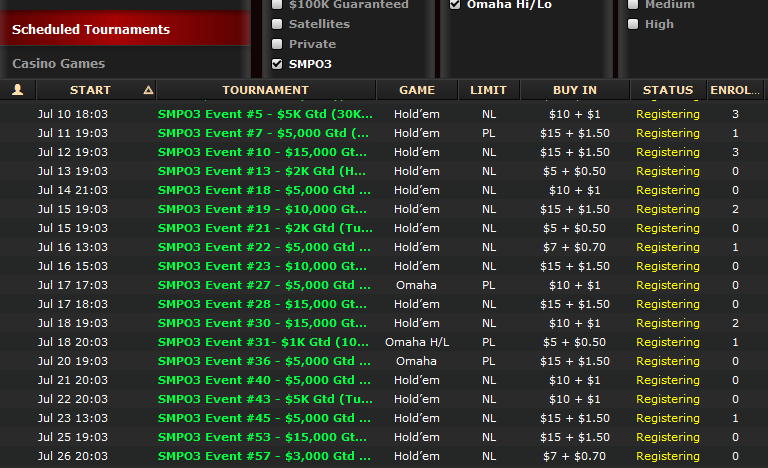 All SMPO3 Events and Qualifiers are displayed in “GREEN” on the Bovada Tournament Lobby. Qualifiers are running now thru July 31st and include multi seat qualifiers, Sit’n’go’s and Last chance tournaments. Qualifier Buy-ins start as low as 88¢, $1, $1.10, $2.20, $4.40 and $5.50. 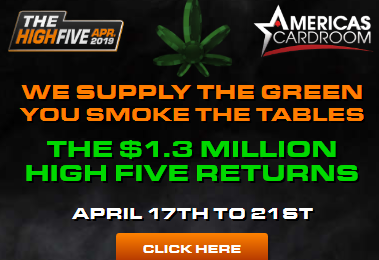 There are plenty of $5K, $10K, $15K and $20K guarantees scheduled daily during SMPO3 and the Mega-Guarantees of $33K, $50K, $100K, $150K are there every week-end. The SMPO3 Main Event, with a $400,000 guarantee starts on Sunday, July 31st at 5:03PM ET.